AU Dry Air Cleaners - Vortox Air technology, Inc. AU style air cleaners are designed to meet the needs of moderate to heavy dust applications where horizontal mounting is required. AU styles are multistage air cleaners where a vertically mounted inlet tube and horizontal outlet tube are required. All AU style air cleaners are designed for outdoor use. 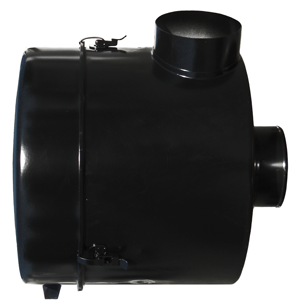 AU style air cleaners are constructed of Electro Galvanized Carbon Steel and finished in a black powder coating. Rigid and durable steel construction provides long life and years of continuous service in severe environments such as the on-highway, stationary engine, industrial, compressor, generator set, and irrigation industries. An efficient first stage of dust removal is accomplished by spinning the dust to the end cap of the air cleaner where it is accumulated and ejected through the ejection valve. High capacity air filters are used to perform final filtration prior to entering the air intake stream. All AU style air cleaners are made to accept Vortox Air Technology Inlet Caps, which remove large debris in the air and serve as a shield against rain. Additionally, all air cleaners can be mounted with Vortox Air Technology BB style Band Brackets.